Even as Samsung, Apple and others tout the benefits of larger and larger screens, there are people who would prefer to have a handset that doesn’t fall out of your pocket because it’s too big. The Posh Mobile Micro X is a tiny smartphone that sports a 2.4-inch display and fits right in the palm of your hand. UNLOCKED.NO CONTRACT.DUAL SIM.READY FOR USE. 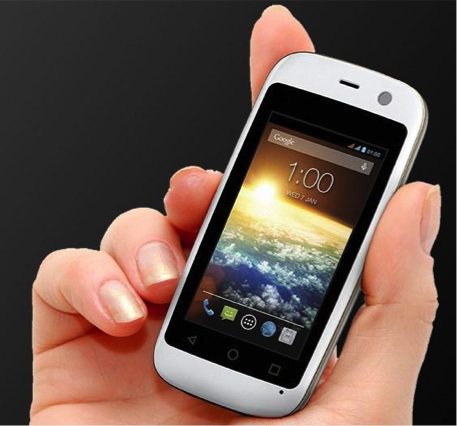 SMALLEST PHONE IN THE WORLD.A SMALL-sized 2.4″ LCD display and a 650 mAh removable Li-ion battery. 2MP Primary Camera, VGA Front Camera. DUAL-CORE PROCESSOR.POWERED BY MEDIATEK. The Dual-Core, 1.0 ghz blazing-fast processor with a 512MB of RAM is powered the MediaTek 6572M chipset and Android OS version 4.4 Kit Kat. WHATS'S IN THE BOX? $15 Free Uber Travel with purchase (New Uber users only). Phone, wall adapter, charging cable, headphones, manual, battery, screen protector, 1 Year Warranty and Unlimited lifetime support.